This page will provide a basic understanding of how Thunderbird handles SMTP servers and will hopefully answer any questions regarding sending mail with Thunderbird. While there are many different combinations of SMTP server setups, a few general cases will be covered. Concepts from these cases can be applied for configuring other setups. Note: Any names, email addresses, and server names contained on this page are used as examples only. When a new account is added, it is set to use the default SMTP server. This does not mean that it is set to "Always use default server"--it is actually assigned to the name of the default server (ie. smtp.mail.com). To view and edit the list of configured SMTP servers, go to Tools > Account Settings and on the left, select Outgoing Server (SMTP). The window will display the information for the current default server. Click on the Advanced button to see all of the SMTP servers. From this window, you can add, edit, and delete servers. You can also select which server you'd like to have as the default server. This window will be called the Advanced SMTP Settings window. If you have the Buttons! extension installed, you can add the SMTP! button to the main Thunderbird window or to the compose mail window for one-click access to the Advanced SMTP Settings window. You can also use the dropdown on the button to quickly view and select the default server. For more information, visit the extension homepage. If you have the Show SMTP Username extension installed, you can change the way that servers are listed in the Advanced SMTP Settings window. For example, you can append the username associated with the server or even give the server a nickname to be displayed. For more information, visit the extension homepage. Each account is assigned to use an SMTP server. To view or select which server an account uses, go to Tools > Account Settings and on the left, select Server Settings under the account name. Click on the Advanced button and select the SMTP tab. 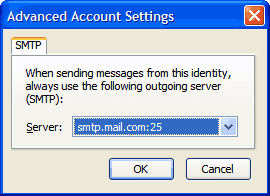 The account can be assigned to use a specific server by selecting the name of the SMTP server from the dropdown menu. Alternatively, the account can be assigned to use the default server, in which case "Always use default server" should be selected. This window will be called the Advanced Account Settings window. If you have the Show SMTP Username extension installed, you can change the way that servers are listed in the Advanced Account Settings window. For example, you can append the username associated with the server or even give the server a nickname to be displayed. For more information, visit the extension homepage. Many Internet Service Providers (ISPs) require you to send mail through their SMTP server. In this case, you will want all of your accounts assigned to use your ISP's SMTP server. 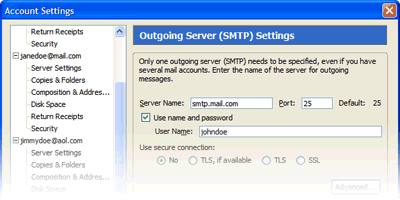 Assuming that you have added the server to the list of SMTP servers, there are two ways of setting up the accounts. You can assign all accounts to specifically use your ISP's SMTP server by selecting the server from the dropdown menu in the Advanced Account Settings window for each account. You can assign all accounts to "Always use default server" in the Advanced Account Settings window for each account. The second method is recommended because if you change locations and need to use another SMTP server for all of your accounts, you can just set the desired SMTP server as the default server in the Advanced SMTP Settings window and all accounts will be assigned to use it. With the first method, you would have to go into each account's Advanced Account Settings window and select the desired server. If you are not restricted to using one SMTP server for all of your accounts and require each account to send mail through different servers, simple go to each account's Advanced Account Settings window and select the desired server. If you have two or more SMTP servers set up to use the same server but login with different usernames, be sure to check out Show SMTP Username to change how servers are listed. You can also give each server a nickname such as "Home" and "Work". For more information, visit the extension homepage. By reading the two setup examples, you should be able to adapt the instructions for setting up other configurations. If you need further help, visit the MozillaZine forums for Thunderbird Support. Plug: Don't forget to check out the Show SMTP Username extension and the SMTP! button that is included with the Buttons! extension. Both of these extensions will make your life a lot easier if you have to deal with the SMTP configurations frequently.